Mark (Dougie) Bishop from Hereford and myself both studied Physics @ Birmingham University from 76 to 79. He was into Northern in a big way and had a lot of contacts in the city. As well as Graham Warr and Soul Galore in Oasis, The Diskery and Reddingtons, there were two record shops in Selly Oak. ‘Funky Duncs Record Shop’ was run by a couple of in your face gays. Dunc had every British Motown release from TMG500 and used to DJ ocasionally at our Brum Uni Soul Club do’s. 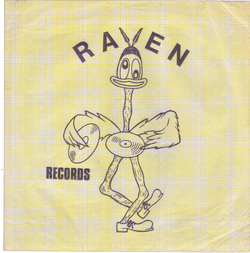 The other shop was Raven Records. I think his name was Paul Raven and he had a huge quantity of imports and pressings. They cost next to nothing – great for us poor students. Comment: Bernie Priekulis. Name Nick Cooke:Comment Remember the shop well. I lived between Selly Oak and Northfield and had a holiday job at Boxfoldia in Selly Oak '74 and '75. I was and still am a sixties soul fan and still have a bag same as the picture and some of the discs I bought there. ( July27, 2016).